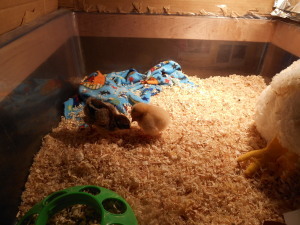 Our chickens, Fritzie and Miss Chick, turned one year old this April. Some of you remember them as tiny balls of fluff. Now they are plump and portly. I say that in the least edible way, despite threats from the kitchen staff upstairs. Miss Chick, named after our beloved original chicken, is a gigantic Partridge Cochin. 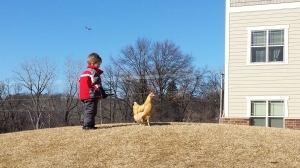 Fritzie, named for Grandpa Kenny Fritz, is a golden (plump) Buff Orpington. Both breeds were highly recommended to us based on their gentle dispositions. Last April our chicks were snug, cozy, and nestled under a heat lamp in the Autumn Room. They were petted gently by the children daily and grew accustomed to the constant chatter of preschoolers. Despite our best efforts, they refused to eat anything but ground corn. At two months they were allowed to go outside in a little hand-made pen, but only in the presence of active preschoolers who were deterrents to predators. This year, the moment a teacher arrives at school in the morning, they remind us assertively that it is time to go outside. Currently, we trust that our chickens are too fat to be plucked off our playground. I don’t know there is a hawk capable of heaving one of our buxom girls to carry away. Our most cherished time is the end of the day; when Sarah Kern opens the classroom door, the pair comes running from wherever they happen to be, and walk right into the school on their own! This shows tremendous progress, folks, as months ago it often required four of us teaming up to capture them when it was time to come inside. Fritzie and Miss Chick have been the grateful beneficiaries of fruits and vegetables leftover from lunch and snack time. Their culinary tastes have grown exponentially. Their cuisine now includes blackberries, strawberries, wheat crackers, mealworms, and barbecued ribs. Their favorite is watermelon. The warm sun of spring along with their ample diet has transformed them into prolific layers. They each lay an egg almost daily. These delicious eggs are welcome payment for the time we spend cleaning up after them! These two girls are so inseparable that my heart skips a beat when I catch a glimpse of one outside without the other. If you see Fritzie or Miss Chick in the courtyard, please stop to say hello. If you happen to have watermelon in your pocket, you will become instant friends!